Hybrid V 6Kw 3P. Pure sine wave max. 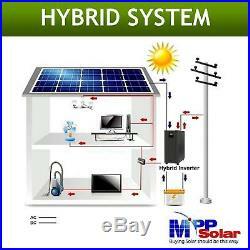 HYBRID Grid-Tie / Off Grid SOLAR inverter for. 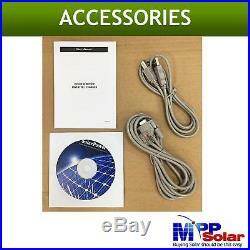 MPPT solar charger (max 9kw PV array). Total system max charging. Bundled monitoring & setting software. Supports 50hz or 60hz (program adjustable). Grid feedback when there is excess energy. 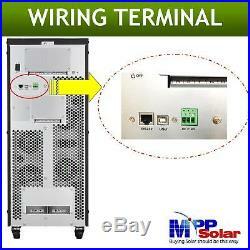 USB or RS232/ Dry contact interface available. Timer setting for AC charging & output now available. How Does It Work? COMMON Q & A. What is the difference between your OFF-GRID and HYBRID line inverters? Very simply put, our HYBRID models. MPI 4K, 5.5K, 10K, hybrid V series. Are inverters which have the capability of acting like an off-grid inverter but also with the added functionality of feeding back to grid. Please note while Hybrid V series can grid-feedback this is intended for use in countries with loose or no feedback regulations. So please check with your power authority for requirement. If you do not require grid-feedback and only plan to draw power from grid for backup purposes, then we would recommend considering our off-grid line inverters. Do I require a battery to turn this on? This inverter supports battery-less operation so users have the choice to operate using only solar and/or grid directly to load. Battery is not necessary. When unit operates without battery, it is normal that LCD will display warning notification that no battery is being used. Does the Hybrid V 6Kw 3Phase support parallel operation? No, the Hybrid V series unit only limited to 3k, 4k, and 5k models which support up to 6 units in parallel. Parallel kits are still required for each and every unit that is in a parallel system. Does the Hybrid V series support Modbus Card and Energy Meter? No, the Hybrid V series is not designed to support Modbus Card or Energy Meter. How do I know this is the RIGHT inverter for me? First, how much power (in watt) does your load require in total? Take special consideration for heavy loads such as pumps, motors, power tools, as these tend to draw very high surge current and need to be sized separately! My country uses 120v/240v Split Phase system. Can I use this inverter? 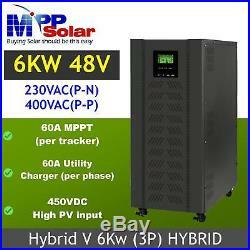 We do not offer “split phase” inverters at this time. Unless otherwise stated, all our inverters are 220-240v output by default. You may use this inverter IF ONLY you plan to run strictly 220-240v load in your country. However, if you need to run 110/120v load, you must acquire an external step-down generator! With only a few exceptions. Drop us a message. Please consider these important guidelines. This is faster and easier than having to spend your valuable time to return! Please consider this carefully before opening a return. If you run into a problem with your order e. Not receiving item, or item not working correctly. So we can help. Our goal is to be your long term 5-star supplier. Please give us a chance to make this happen. The item “3 Phase 6000w 48vdc Hybrid Solar inverter grid tie + off grid PV input 450vdc” is in sale since Friday, October 19, 2018. This item is in the category “Home & Garden\Home Improvement\Electrical & Solar\Alternative & Solar Energy\Chargers & Inverters”. 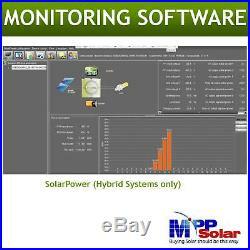 The seller is “maximum_solar” and is located in Taipei. This item can be shipped to North, South, or Latin America, all countries in Europe, all countries in continental Asia, Australia.